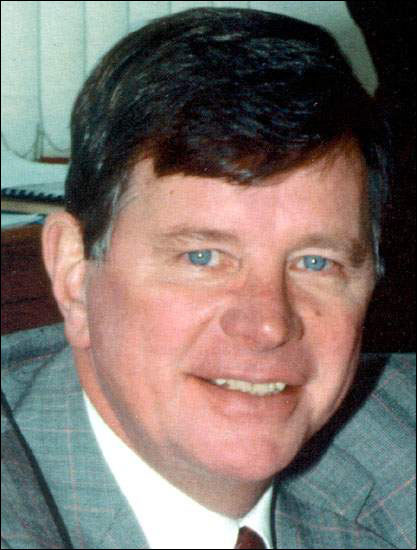 Constitutional battles and severe economic cutbacks characterized the Liberal administration led by Clyde Wells from April 1989 to January 1996. Soon after entering office, Wells's strident opposition to the Meech Lake Constitutional Accord strained his relations with the federal and Quebec governments, but earned him praise in English Canada and his home province. He was widely perceived as a central figure in the Accord's ultimate demise. Clyde Wells served as premier of Newfoundland and Labrador from 20 April 1989 until 26 January 1996. Economic troubles later eroded Wells's popularity in Newfoundland and Labrador. The collapse of the cod fisheries, a sizeable deficit, and a drop in federal funding prompted the government to introduce a string of austere budgets. Wage freezes and sweeping layoffs drew sharp criticism from unions and the civil service, but were effective at reducing public spending in a time of economic hardship. Nonetheless, unemployment rates remained high throughout Wells's time in office and personal incomes below the national average. Other issues that occupied the Wells administration included education reform, rural development, the forced amalgamation of smaller centres with St. John's, and a failed attempt to privatize Newfoundland and Labrador Hydro. The election of a Liberal administration led by Clyde Wells on 20 April 1989 ended 17 years of Progressive Conservative government. The Tories had failed to curb high unemployment rates and gain greater control over fisheries management. The costly Sprung Greenhouse fiasco and Brian Peckford's resignation as premier in March 1989 further eroded party strength. By the time new Conservative leader Tom Rideout called a snap election one month later, the public was ready for a change. The Liberal Party provided a strong alternative. Wells was a respected corporate lawyer and, from 1966-68, a cabinet minister in Joseph Smallwood's administration. 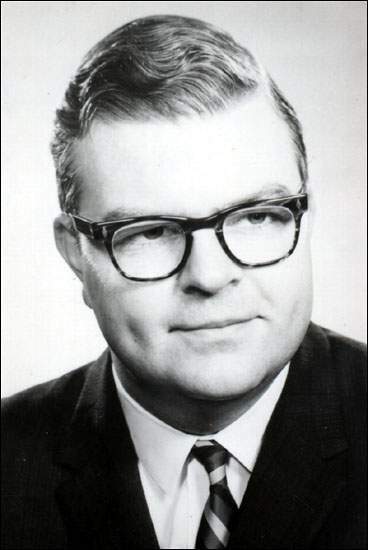 He and his colleague John Crosbie won public approval by resigning their portfolios in 1968 to protest Smallwood's decision to give the American financier John Shaheen a $5-million loan connected to the proposed oil refinery at Come By Chance. Wells returned to politics as Liberal leader in 1987 and his popularity steadily increased as Peckford's declined. Clyde Wells and John Crosbie were cabinet ministers in the 1960s. They won public approval by resigning their portfolios in 1968 to protest Premier Joseph Smallwood's decision to give American financier John Shaheen a $5-million loan connected to the proposed oil refinery at Come By Chance. Photo by Garland Studio. Courtesy of Archives and Special Collections (J.R. Smallwood Collection 075, 5.05.354), Queen Elizabeth II Library, Memorial University of Newfoundland, St. John's, NL. Wells brought a new style of leadership to the House of Assembly. Level headed, intellectual, and principled, he contrasted sharply with Peckford's fiery and combative image. While the Conservatives had fought for greater independence from the federal government, Wells, a federalist, wished to strengthen the province's ties with Ottawa. He believed the country would be better served by a strong central government that treated all provinces equally. In the 1989 general election, the Liberals won 31 seats and the Tories 21. Wells drew national attention early in his premiership by opposing the Meech Lake Constitutional Accord. Negotiated by the 10 premiers and Prime Minister Brian Mulroney on 30 April 1987, the Accord proposed to reform Canada's Constitution by recognizing Québec as a distinct society and granting the provinces greater powers in such areas as Supreme Court appointments, immigration, and future constitutional changes. All provincial legislatures and the federal parliament had to ratify the Accord by 23 June 1990. The Newfoundland legislature did so on 7 July 1987. The Accord had not been an election issue, but it dominated the first year of Wells's premiership. He had strongly objected to the Accord as Opposition leader and announced in his 25 May 1989 Throne Speech that he would ask the House of Assembly to rescind its previous approval. He argued that the Accord disadvantaged poorer provinces by limiting federal spending and would make Senate reform and future constitutional amendments almost impossible. His most controversial objection was to the distinct society clause. A strong advocate of provincial equality, Wells felt the Accord would have granted Québec special status. His views brought praise from English-speaking Canada, but severe criticism from Quebec and Mulroney. Wells dismissed as fear mongering the argument that rejection of the Accord would revive the Quebec separatist movement. In the end, Meech Lake failed - the deadline passed without the necessary ratification from the Manitoba and Newfoundland legislatures. Constitutional debate was soon overshadowed in Newfoundland and Labrador by severe economic hardships. After decades of sustained intensive fishing by Canadian and foreign fleets, the Northern cod stocks collapsed and the federal government imposed a moratorium on 2 July 1992. The closure put about 30,000 local people out of work and ended a way of life that had endured for generations in many outport communities. Ottawa unveiled a compensation package for unemployed fishers and plant workers, but Wells, whose relationship with the federal government remained strained after Meech Lake, was not involved in the planning process. The Northern Cod Adjustment and Rehabilitation Program (NCARP) paid affected workers between $225 and $406 a week and required them to train for work in other fields. It was replaced by The Atlantic Groundfish Strategy (TAGS) in 1994, which paid between $211 and $382 a week. The federal government intended TAGS to remain active until 1999, but the $1.9-billion program ran out of funds in May 1998. The 1992 cod moratorium put about 30,000 fishers and plant workers from Newfoundland and Labrador out of work. Reproduced by permission of Scott Woodman, ©1991. Both programs met with limited success. Critics argued fishers were not adequately compensated or prepared for work in other fields. Outmigration plagued rural areas, where few other industries and businesses existed to absorb the unemployed. Thousands of people moved to urban centres or left the province to find work. Statistics Canada reports that the population of rural Newfoundland and Labrador dropped from 264,023 to 216,734 between 1991 and 2001. The economy struggled in other areas as well. The provincial debt was $5.2 billion in 1990, making it one of the highest per capita debts in the country. Also, the federal government had entered a period of fiscal restraint and reduced transfer payments to the provinces. 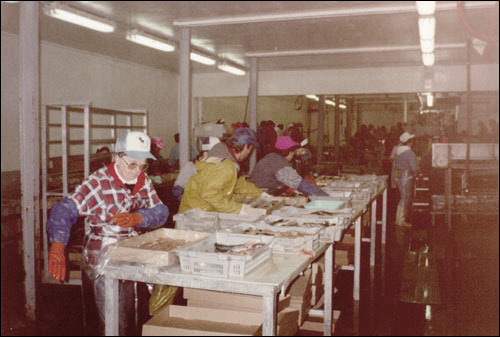 Until the early 1990s, federal funds and the cod fisheries had been central to the Newfoundland and Labrador economy. To compensate, the province cut back dramatically on government spending. Early measures included the reduction of government departments from 18 to 12 and the dismantling of a $238,000 ombudsman office created under the Moores administration. Wells's most severe cutbacks came in the March 1991 budget, which laid off 1,300 permanent and 700 part-time civil servants, eliminated 500 vacant positions, and reduced management and executive staff by 10 per cent. It also imposed a one-year pay freeze on public employees. This action enraged union leaders since it overturned previously negotiated salary increases for the 1991-1992 fiscal year, as well as a pay-equity plan for the health-care sector. The budget also cut government funding to health care and other services by $37 million. Unions vigorously protested the measures in a "Clyde Lied" campaign, but could not prevent the government from extending the wage freeze for another year in its March 1992 budget. Other issues also occupied Wells during his first term as premier. He kept a 1989 election promise to rejuvenate rural development by forming the Economic Recovery Commission (ERC) soon after assuming office. Led by J.D. House, former chair of the Royal Commission on Employment and Unemployment, the ERC's mandate was to shift the provincial economy away from primary resources and federal transfer payments by diversifying it into other sectors. Its goal was to establish a strong private sector of small businesses that could employ workers in all regions. The ERC, however, was hampered by the economic restraint of the early 1990s as well as resistance from the existing bureaucracy. Unable to produce favourable short-term results, the commission was dismantled soon after Wells retired from office in 1996. Wells was also a proponent of amalgamation, but met with resistance from the St. John's suburbs of Mount Pearl, Goulds, and Wedgewood Park when he suggested in 1989 that they merge with the capital city. Although all three towns strongly opposed amalgamation, only Mount Pearl was permitted to remain independent; the province introduced Bill 50 in 1991 forcing Goulds and Wedgewood Park to join St. John's. Wells campaigned on a platform of fiscal austerity in the 1993 general election and was returned to office with an increased majority. His strong mandate for continued economic restraint paved the way for more cutbacks. In 1995, the government eliminated 445 jobs and reduced funding to health care, social services, education, municipalities, and other areas by $30 million, but it also tabled the first balanced budget in the province's history. One of Wells's cost-saving measures erupted into controversy early in his second term. In 1994, he announced plans to privatize the publicly owned Newfoundland and Labrador Hydro, arguing the sale would remove $1.2 billion from the province's debt and allow the utility to operate more efficiently. The decision was strongly opposed by the public and resulted in protests, petitions, and dozens of letters to local newspapers. Opponents pointed out the utility had been consistently profitable during the previous decade and argued that privatization would result in higher electricity rates. The Progressive Conservative Party likened the plan to Smallwood's disastrous 1969 Churchill Falls deal, which sold cheap electricity to Hydro-Québec until the year 2041. Liberal MHA Walter Noel also criticized Wells for not holding public hearings. "The premier's national and provincial reputation was built significantly on the way he dealt with the constitutional issue and his determination to listen to what people said," Noel told reporters. "Most people felt he dealt with Hydro in a different manner that was not in keeping with the Clyde Wells who they had developed such great respect for" (Cox, "Wells" A4). The controversy damaged Wells's standing among voters and his approval rating dropped from 71 per cent in April 1991 to 52 per cent in November 1994. Later that month, the province put its plans for privatization on hold and abandoned the process altogether in 1995. Public debate turned to education reform in 1995 as the Wells administration tried to replace the traditional denominational school system with a single, less costly secular one. The change would have reduced the number of school boards from 27 to 10, closed more than 100 schools, and saved the province $30 million annually. A provincial referendum on 5 September 1995 revealed that the majority of voters (54.4 per cent) supported education reform, but changes were blocked in 1997 after the Roman Catholic Church, the Pentecostal Assemblies, and 29 parents successfully challenged the re-designation process in the Supreme Court of Newfoundland. Education reform was subsequently taken up by another Liberal administration, led by Brian Tobin. Wells announced his plans to leave politics in December 1995 and retired as premier on 26 January 1996. "Anonymity is a wonderful thing," he told Maclean's magazine. "I welcome a return to it" (DeMont 12). He predicted the province would experience another two years of economic hardship before entering a period of growth, fuelled by oil, mining operations in Labrador, and a burgeoning shellfish industry. Wells returned to his legal practice and in 1998 was appointed to the Supreme Court of Newfoundland (Court of Appeal), serving as Chief Justice from 1999 until his retirement on 28 February 2009. For other related articles view the Government and Politics Table of Contents Wells Government section.